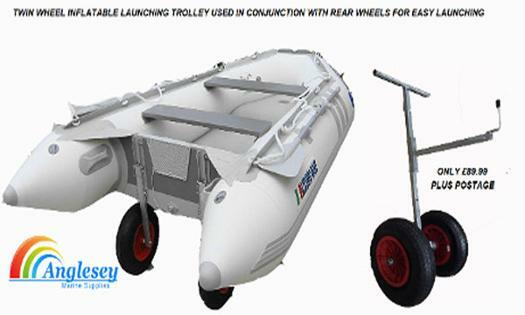 We manufacturer our own design of folding dinghy launching trolleys available direct to the public, this ensures that you the customer receives the very best deal available. 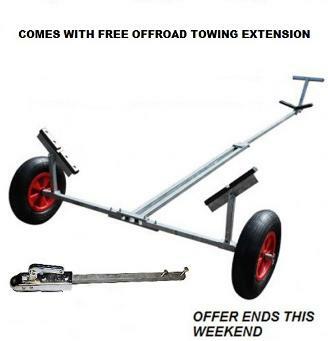 So whether its our standard dinghy launch trolley, or our larger elite dinghy launching trolley with or without boat rollers or large side supports you will not get a better deal elsewhere. 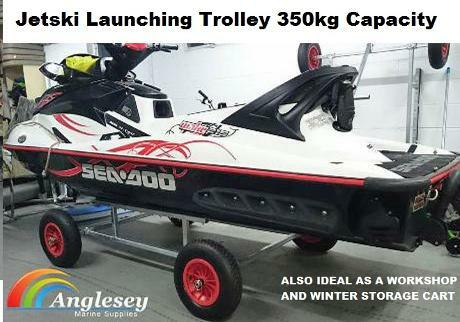 Dinghy Launching Trolleys from only £155, Large Dinghy Launching Trolley, Kayak or Canoes we have Launching Trolleys, Carts and Wheels to suit most boats, Jetski Launching Carts and Trolleys also supplied. 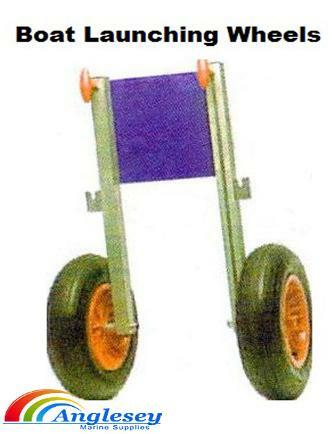 Boat launching wheels and Inflatable boat launching trolleys also sold. 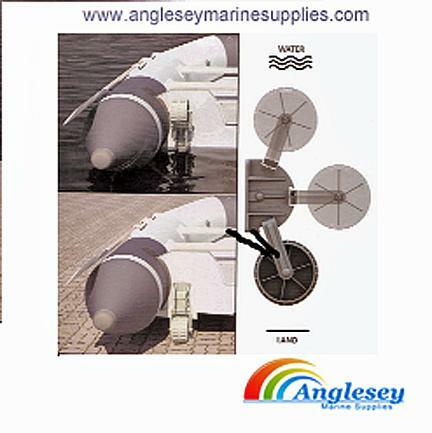 Our Folding Dinghy Launching Trolley comes in two sizes, the smaller model is the "Swift" capable of carrying vessels boats up to 12 feet long and 120kg capacity and then we have the "Elite" dinghy launching trolley which will carry vessels up to 16 feet long and capable of carrying up to 180kg, Anglesey Marine Supplies For Launching Trolleys, Dollys Wheels And Carts. Both dinghy launching trolleys are constructed from Premium Grade fully galvanised steel and fitted with protective non marking snubbers. We use pneumatic tyres held on with Bzp Lynch Pins on both models to ensure a smooth ride over sand or shingle. All upright and vee snubber supports and handle are fully adjustable on both models as standard. Another unique feature on our dinghy launching / launch trolleys is the front bars are pre-drilled ready to accept a pressed steel hitch should you require off-road towing assistance. Our Swift folding dinghy launching trolley is capable of carrying vessels up to 12 feet long and 120kg, fully galvanized construction, fully adjustable design, non marking snubber supports, the dinghy launch trolley folds away easily in seconds to fit into most family cars. Built to last. Our Swift dinghy launching trolley with towing extension is capable of carrying vessels up to 12 feet long and 120kg, fully galvanized construction, fully adjustable design, non marking snubber supports, the dinghy launching trolley folds away easily in seconds to fit into most family cars. Built to last. Now comes with a towing extension included. 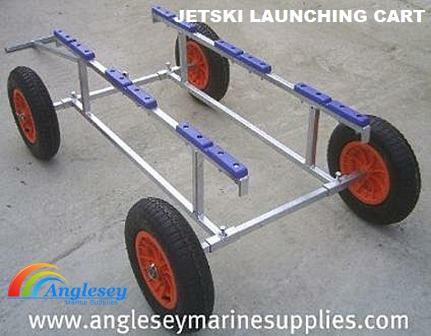 The best compact dinghy launching trolley on the market. 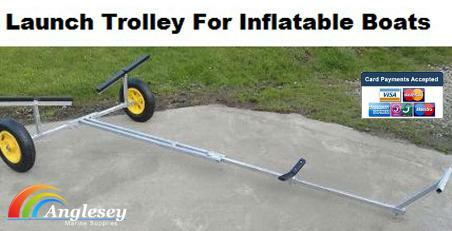 Dinghy Launching Trolley For Inflatable Boats. A new introduction for the 2016 season our unique Swift dinghy launching trolley fitted with larger rear supports to accommodate small ribs and inflatable boats. Each support on the launching trolley is 2 feet long giving maximum support. The supports on the launching trolley can also be turned to run parallel with the trolley to enable good support on inflatable dinghys. Galvanized steel construction, polypropylene non marking snubbers, all fully adjustable making this launching trolley a perfect choice. 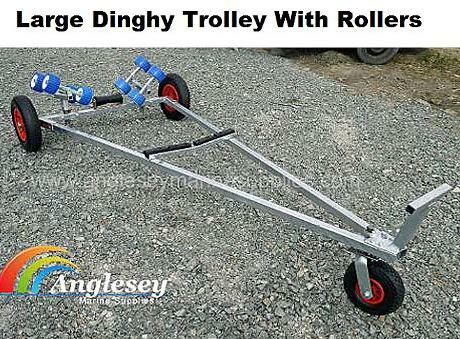 A off road towing attachment is available for this dinghy launching trolley (see below). Same high quality dinghy launching trolley and spec as above but with a slight difference, this one is fitted with non marking rear rollers instead of snubbers. 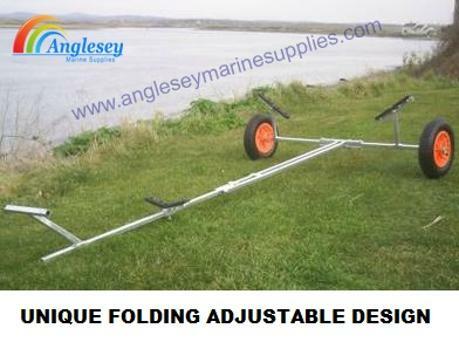 Ideal for Ribs and inflatables, the only folding dinghy launching trolley with rollers. Make launching and loading your boat effortless. 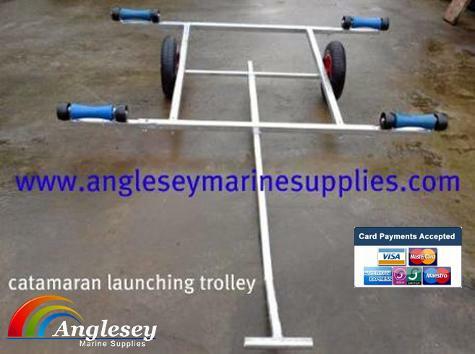 Dinghy launch trolley with rollers. 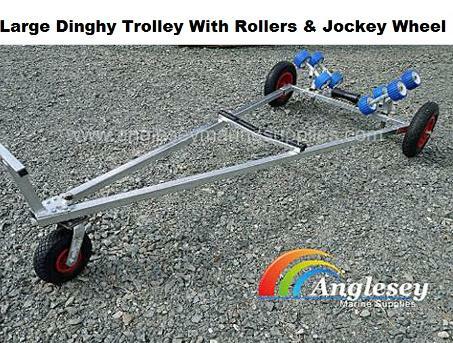 The setting up of our dinghy launching trolley and Dinghy launching trolley with rollers is clearly shown on you tube. Its very easy and takes very little time or effort. We manufacture two different sizes however both are similiar in design and are just as easy. You can also rest assured that purchasing from us you will recieve the exact same quality product. Ideal for ribs, dinghys, sailing, tenders, inflatables, small boats etc. New for 2016, fully galvanized folding dinghy launching trolley fitted with webbing strap, ideal for thin hulled boat e.g laser 1 etc. Capable of carrying boats up to 12 feet long and 120kg in weight. Neatly folds away to fit into your car boot. All carrying points are adjustable along with the vee snubber and handle. 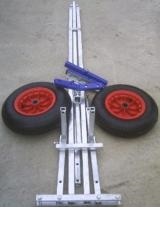 Also the front of the dinghy launching trolley is predrilled to accept our off road towing hitch sold separately. Dinghy launching trolley towing extension bar, fastens onto our predrilled dinghy launching trolley using two M10 bolts. 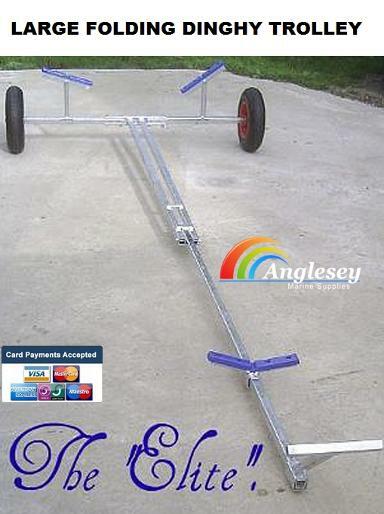 Allows the dinghy launching trolley to be towed slowly off road. Fits all the above foldable dinghy launching trolleys. Extra accessories available include a jockey wheel, tow hitch(for off road) and a mast support. 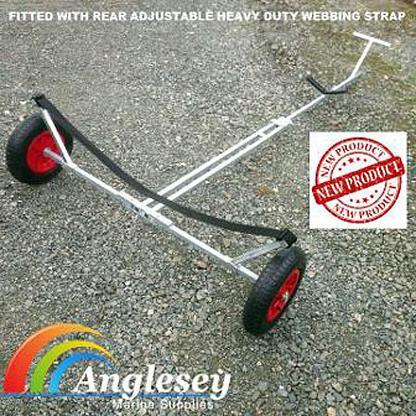 A versatile fully adjustable boat dinghy launching trolley. 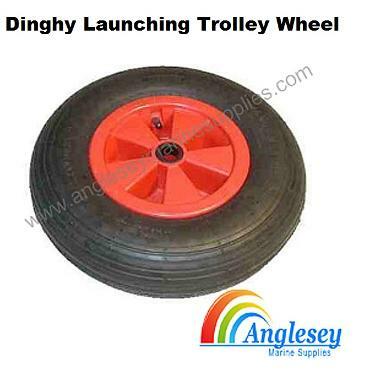 Replacement dinghy launching trolley wheel for our wide range of dinghy launching trolleys. 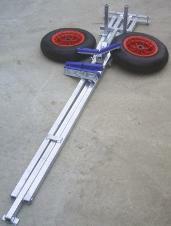 15 1/2” (394mm) launch trolley wheel with pneumatic tyre and polypropolene centre. 1” (25mm) plain bore. Tyre width 3 3/4” (95mm). 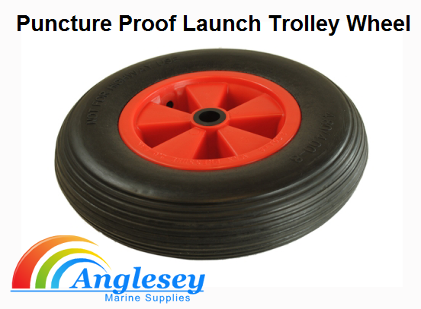 Puncture proof dinghy launching trolley wheel, cellular foam wheel eliminates annoying punctures, guaranteeing trouble free use every time, same dimensions as the wheel above with a 1" internal bore. Catamaran launching trolley. Fully galvanized construction. Fully adjustable telescopic support arms fitted with non marking large 8" rollers c/w castor rollers. Fitted with easily removable large pneumatic wheels. Adjustable pull handle for optimum balancing depending on length of boat. Can fit catamaran, boats and inflatables up to 7 foot 6" between centre of sponsons, telescopes in to 63". Easily load and unload boat on with the roller assembly. Hot dipped galvanised for maximum protection. 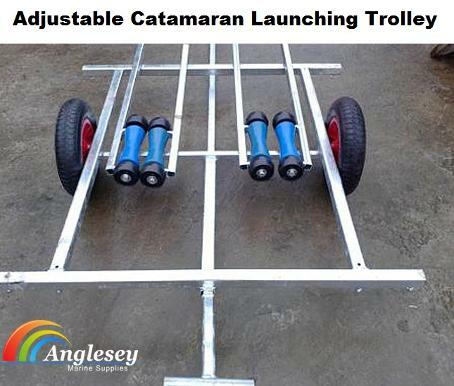 A popular type of catamaran launching trolley. Ideal for Hobie Cat Packs down to a easily storable and transportable size, base frame is 4 foot square. Kayak launching trolley and canoe launching trolley carrier made from tubular anodized aluminium with rubber protectors for boat support. fitted with pneumatic wheels for added protection on rugged surfaces. 77.5cm wide x 33.5cm high. 2 types available, the first is a standard type and the second as swivel arms to fit the drain holes on Ocean kayak, Pelican etc, Please use drop bar for choice options. Boat launching dolly. 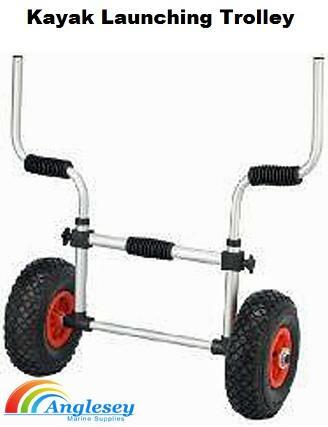 A competitive priced means of launching dinghys , this handy boat launching cart is made from polished zinc plated tubing, with moulded ABS wheels and 170mm diameter double poly tyres. 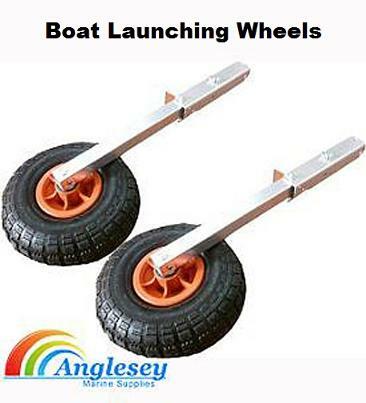 Economy aluminium boat launching wheels dinghy launching wheels that easily lift up in situ or remove when not in use. made from 30mm square section aluminium tubing and fitted with 200mm pneumatic wheels. 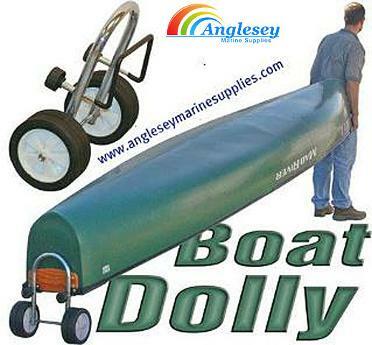 Ideal for dinghies or inflatables for slipway or beach. 150kg capacity. Beachmaster boat launching wheels. The boat launching wheels are manufactured from stainless steel, very robust. 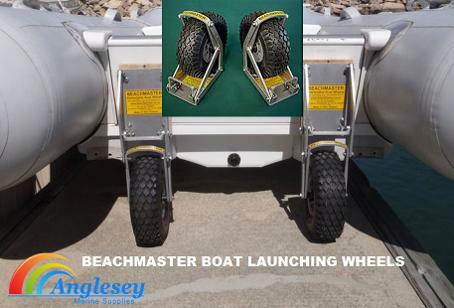 The Beachmaster inflatable boat launching wheels are very easy to raise when not in use. Ideal for inflatable boats. 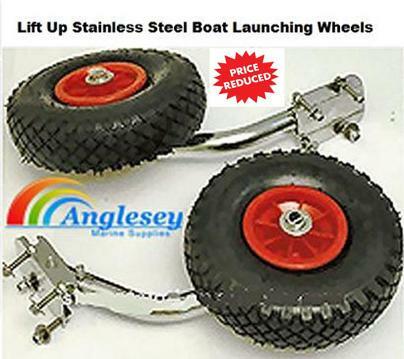 Fixed deluxe stainless steel Boat launching wheels. These premium quality fixed launch wheels are easily detachable when not in use by means of a quick release thumb screw at apex of the leg, they are then easily removed from the transom and stored in boat till needed. Made from marine grade s/s including fittings. fitted with 400mm pneumatic wheels. 250kg carrying capacity. 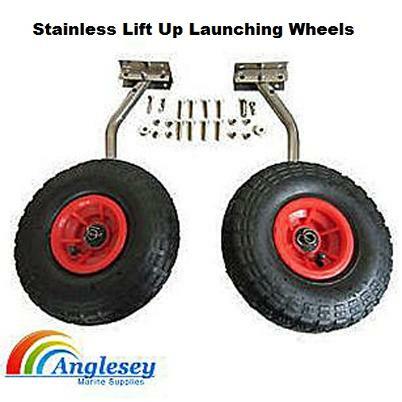 Lift up stainless steel Boat Launching wheels.These top quality launching wheels are permanently fitted to the transom and are designed to swing up when not in use. When sailing the lateral movement of the outboard is not hindered by legs of the launching wheels due to the offset design. Made from marine quality stainless steel with all s/s fittings. 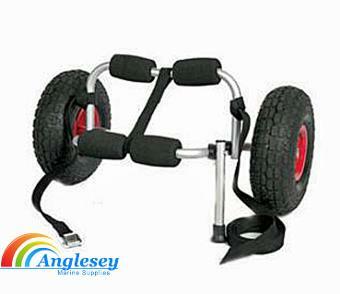 Each leg is fitted with heavy duty wheels and 400 x 8 pneumatic tyres. 160kg capacity. 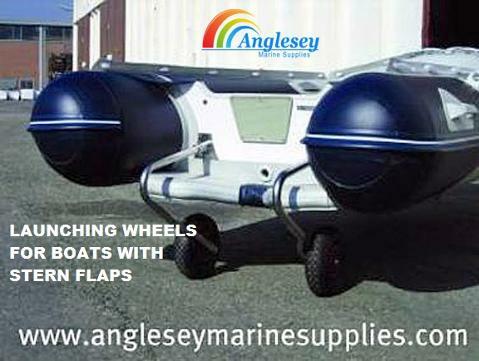 Boat Launching wheels for stern flaps or extended transom, making it impractical to fit standard launch attachments. Made from marine grade 316 stainless steel, swivels on the transom socket easily and safely, falling back into position when leaving the water. Supplied with pneumatic wheels and all necessary fittings. The launch wheels will take boats up to 120kg. Inflatable boat launch wheels. Manufactured from high quality nylon, easy to install and easy to use. Wheels have 3 position wheel locking devise by heavy duty 316 stainless steel spring for easy deployment. The wheels use lightweight material and are completely maintenance free. Economy 316 marine grade stainless steel boat launching wheels lift up. Can be easily lifted up or down made from highly polished s/s tube. Fitted with 300 x 4 pneumatic wheels. Will fit all types of boats, ribs and inflatables. 200kg. carrying capacity. Two types available, Long or short to suit keel depth. 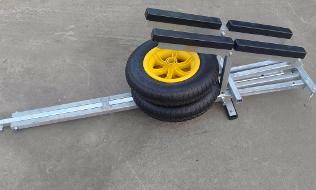 We have for sale a twin wheel inflatable boat launching trolley dolly, used to carry the front end of your inflatable boat when rear wheels are fitted (sold seperately). Sometimes manually carrying the front of the boat can be a strain, especially if loaded, this trolley simply hooks onto your bow shackle so you can carry it easily. Manufactured from 25mm galvanized steel and fitted with 14" pneumatic wheels. The part that hooks onto the bow shackle is adjustable to enable getting the height correct to your boat. Packs down flat when not in use. Boat Launching Trolley.Please note this is for the twin wheel launch trolley only and not the rear wheels sold seperately. Superb piece of kit, our jetski launching trolley, dolly is ideal for the launch of boats, dinghies, jetskis, pwc etc or can be used for the launching or recovery of larger boats in conjunction with transom mounted launching wheels. Manufactured from 30mm box section galvanized steel, fully adjustable support rails. Comes with large pneumatic launch trolley wheels. 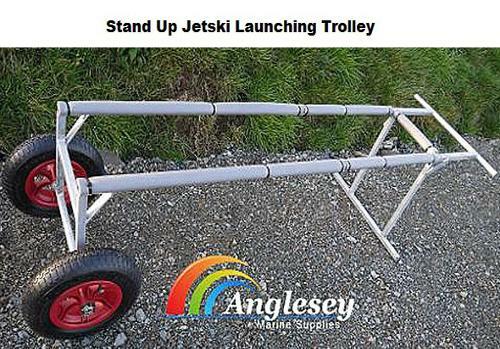 New product for the 2016 forthcoming season our fully galvanized stand up jetski launching trolley fitted with large 14" pneumatic wheels, manufactured from 25mm box section fully galvanized steel. Fitted with large 14" pneumatic wheels held on with simple to remove lynch pins. Set at a reasonable height to allow the jetski to be retrieved and then loaded onto a jet ski trailer or into a van etc. Fitted with a protective neoprene cover to protect the hull of the jet ski. 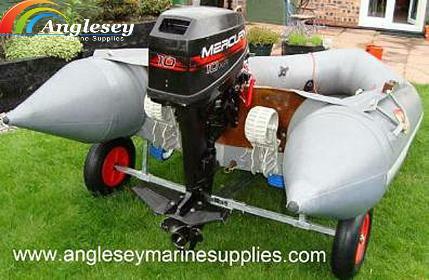 Would also be ideal for small inflatable boats and ribs, tenders etc. Makes launching your boat effortless. Dimension are 350mm between rails and 1900mm long.